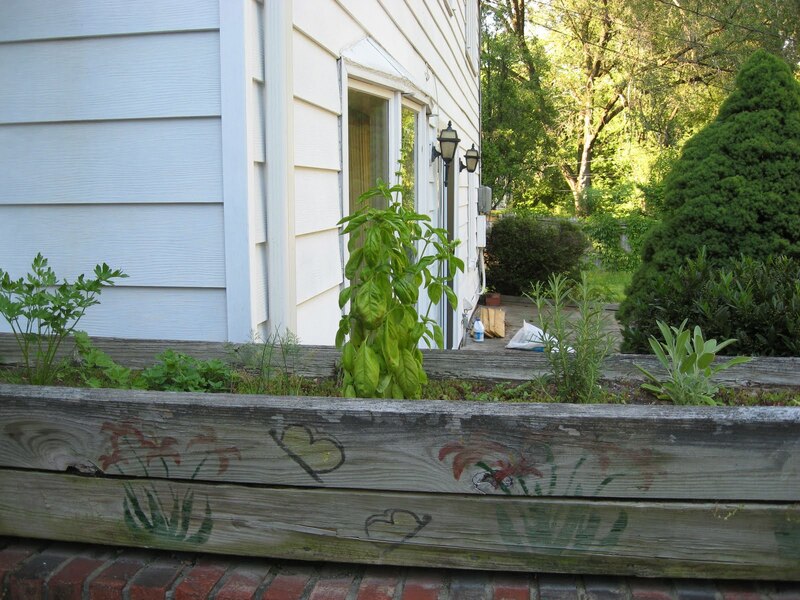 By popular request, here is a look at my herb garden, in a flower box by the deck. From left to right, we have parsley, oregano, dill (beside three measly chives), two giant basil plants, rosemary, and sage. I had some thyme, but I keep killing it, so I won’t bother spending the money for yet another thyme plant just to watch it die. That’s just cruel. Everything you can see in here except the dill and chives was purchased as a small plant – the seeds I started indoors with my tomatoes, back in the spring, didn’t do very well at all, except for a couple of very small oregano and basil plants growing from the leftover seeds I tossed into the box this spring, but you can’t see them from this angle because they’re still tiny and flat. The soil is dry and sandy and not very good, so I count myself lucky to have anything growing at all. Next year, time and money permitting, I want to dump this box and fill it with good potting soil so my plants can do better. I think I’ll paint it white, too. The flowers and butterflies aren’t my style. This entry was posted in Uncategorized on June 6, 2011 by antijen.